My harvest never looked like this. The first pro for the Big Fat Tomato Game (which is definitely not the name - I'm going to get tired of typing that really quickly) is the fuzzy tomatoes. Keep in mind, this is a kids game. And kids like neat fuzzy things in their games. And so do adults. 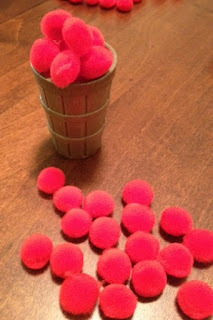 (Adults also like cool looking sculpted plastic pieces in the shape of elves, but this game went with the fuzzy stuff.) It gives the game both a neat "feel" (awesome pun) and gives it a unique tactile experience that you don't often find in board games. The next thing that I like about the tomato game is that it is a light-weight "take that" game. Honestly, it reminds me a lot of a less frustrating version of Mille Bornes. My wife loves Mille Bornes, but I inevitably run out of gas in the first third of a race and never manage to find a gas station. In the tomato game, however, there is nothing that outright prevents you from gaining tomatoes. Some cards reduce your harvest by a die roll, others only allow you to roll a single die, and some even take tomatoes out of your stockpile. However, none of these cards are devastating enough that you really grow irate if someone plays one of them against you. Plus, there are enough different cards to get rid of each negative that none of them will really cripple a player. The third pro that I will mention for the tomato game is that it is incredibly accessible. It could be played with kids as well as adults and, though adults may not want to play it all the time, I think that it can be enjoyed by either age group. It's just a nice, lightweight, game with good natured attacking. (If you're curious about "good natured" attacking, it's the kind of attacking that doesn't cause the player to want to attack you in real life after the game is over.) In the games that I've played, the game was fun, but was light enough that we were able to enjoy the company of the other people playing - with the game adding to that fun without demanding all of our focus. 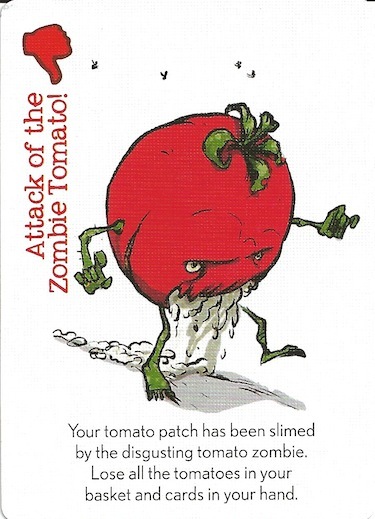 That's right - zombie tomatoes! I really only have one true "con" for the Big Fat Tomato Game. I dislike the stockpiling rule. I don't understand why you have to guess that you have more than 20 tomatoes in your harvest. Specifically, I play with gamers, so this is often not going to be a "guess", but at least one of the people at the table will be tracking how many tomatoes he (and everyone else) has in his harvest. I am ok with the fact that you can't harvest immediately, but I don't know the point of not allowing the players to count the tomatoes in their harvest to see if they have at least 20 tomatoes prior to attempting to stockpile. The other thing that I will mention is something that you need to be aware of, but isn't a true con. This is a card game. And so, you will do better if you draw better cards. This is true of most card games, and remains true in the tomato game. If you draw the awesome card that lets you cancel an attack and send it back at the attacking player, you will do better than if you draw four copies of a less useful card. If this bothers you, then you probably don't play terribly many card games. However, I didn't feel that this game was so luck driven that it bothered me. Overall, I would give The Big Fat Tomato Game an 8.5/10 as a kid's game. It was really enjoyable, and I think that (assuming your kids can read), this is a good choice to play with your whole family. If you are looking for great games for kids, you might also check out Hey, That's My Fish!, Scallywags, and Rory's Story Cubes. 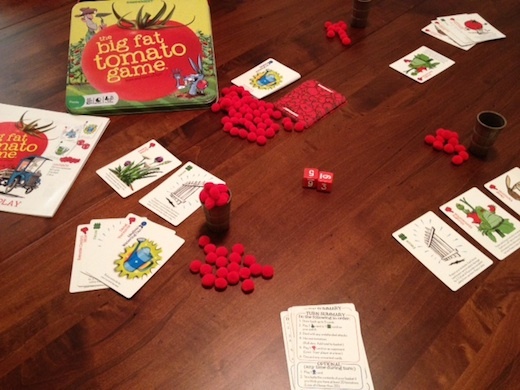 I would like to thank Gamewright for providing me with a review copy of The Big Fat Tomato Game. The next thing that the Builder expansion adds are the pieces for a sixth player. And, well, it's about time. I have never understood why the base game only came with pieces for 5 players. The board was very obviously setup for six players - there was a sixth spot on the turn order track, on the initiative track, and 11 places on the colonist dock (which is how many you need in six players). Why did it take so long to release this? Either way, I am happy that my copy can now be played with six players. Aside from being able to play the game with more friends now, it's also interesting how much more stressful a sixth player causes decisions to be. In a full six player game, when deciding between two different places for your colonist, you can almost guarantee that whichever place you want to go will not be available by the time everyone else has taken their turn, and so you have to pick the one that you really want. The third addition are new buildings, and specifically, new "Spoils of War" buildings. Spoils of War buildings are collected in the capital building track, but do not cost any money. They give you one time bonuses like two extra trade goods, a merchant ship, $5, or specialists for the next turn. I think that the Spoils of War buildings add an interesting new element to the game. Generally, in the base game, you can tell which building someone might be taking. And, if they are on the capital building track, you assume that they are going to buy something. However, with the new Spoils of War buildings, you don't know if they're going to buy something, or simply collect a Spoils of War. And, this can completely throw off your plans if you are in one of the later positions on the capital building track. After all - you might have placed there assuming that you would be able to collect a Spoils of War, but the players in front of you decide that they want it. Then, you are left without being able to collect anything, unless you actually had the money for a building. I thought this was interesting. Some of the other buildings also added a neat new twist - such as the Mayflower, which allows you to use your merchant ships to transport colonists to the new world. Overall, I was happy with the new buildings. The addition that I may have been the most excited about was the addition of National Advantages. 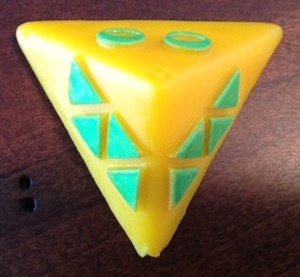 Essentially, these are a way of providing an asymmetric starting position, which I am a huge fan of. Each Nationality has two powers, and the player using that Nationality gets to select one of the roles for the game. Most of the powers mirror Age I buildings - things like +1 Captain, Soldier, Missionary, or Merchant per turn. However, there are a few that are more creative - like +1 coin from every other player per turn. The powers are nice, as they make it less critical to have the first choice of Capital Buildings in the first age. Unfortunately, when using them, the powers really dictate your starting strategy, even if that wasn't a strategy that you normally would want to implement. 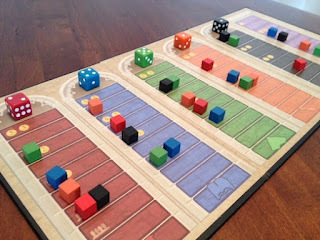 Plus, if you combine powers with a sixth player, the game can get very, very crowded (with powers and six players, you are potentially adding 12 extra workers to be placed every turn, and only opening up 3 more places for these workers). We tried this - and the Discovery box was essentially always full. I like both of the new additions, but will probably not use both of them at the same time again. Also, I wish that the powers had been a bit more creative, instead of mirroring existing buildings - but I'm not really sure what those other powers would look like. The last major change that the Builders expansion added was the ability to buy Victory Points. At the end of Age I, you can buy them for $1 per VP, at the end of Age 2 they are $3 per VP, and at the end of Age III, they are $10 per VP. This really adds a completely different viable strategy to the game. Now, suddenly, you can focus on getting as much money as possible and turning it into Victory Points. I watched as one of my opponents sent two merchants to the new world almost every turn in Age I (his Nationality gave him one per turn, and he often got the merchant specialist position) - collecting $10 per turn. At the end of Age I, he traded in all of his money and collected 40 Victory Points. That's an amazing Age I score! Of course, he was doing this at the cost of having capital buildings to help him in the following Ages. Overall, he did not quite win (he came in second), but he proved that this strategy has a great potential for victory! The one other thing that I will mention (as a con) about this expansion is that the rules aren't especially clear, so you'll want to have the FAQ handy. As an example, the rules don't even tell you how to gain a builder specialist, and the entire expansion is named after him! Another one I was annoyed by was that one of the National Advantages has been completely changed from what is printed on the card. Here's a link to the FAQ on BoardGameGeek. You're welcome. Overall, I give Empires: Builder Expansion an 8.5/10. I think that it is a solid expansion that adds some freshness to one of my favorite games. Though I might not play with every additional element in every game, I will probably continue mixing and matching different elements of the game as I continue playing it. If you like worker placement games like Glenn Drover's Empires, you might also check out Caylus, Kingdom of Solomon, and Pillars of the Earth. 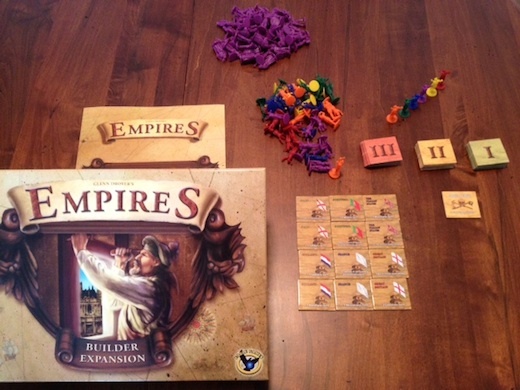 I would like to thank Eagle/Gryphon Games for providing me with a review copy of Empires: Builder Expansion. One of my all time favorite games is Twilight Struggle. Because of this, the fine people of GMT Games suggested that I try out 1989: Dawn of Freedom, since it's by the same designers and is somewhat of a "part 2" to Twilight Struggle. 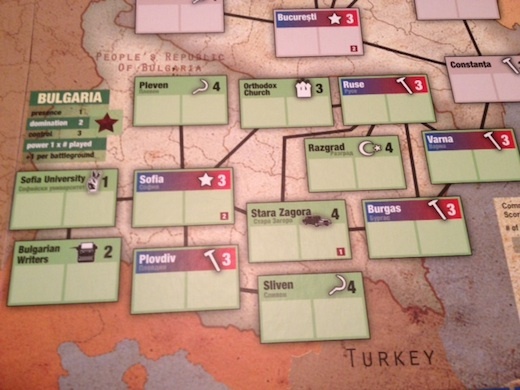 In 1989, each player is struggling to take (or maintain) power in Eastern Europe. 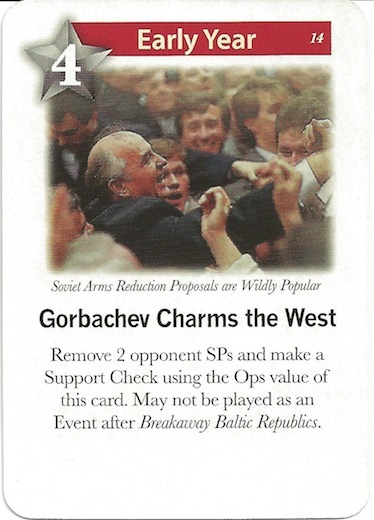 To do this, players alternate playing cards that can either be used for "Ops", for the event showing on the card, or to advance on Tiananmen Square. If using a card for "Ops", the player may add influence to any countries where they currently have influence or are adjacent to countries that have influence. 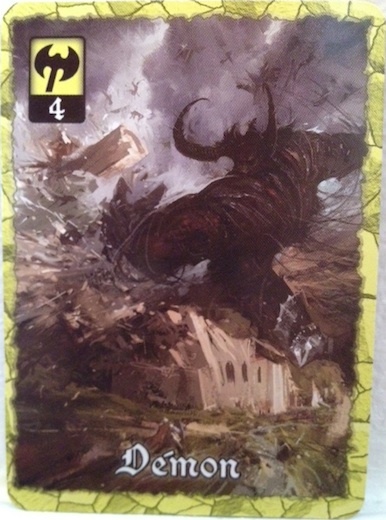 Alternatively, when using a card for Ops, a player may choose to make "support checks" by adding the value of the card, a few modifiers, and a die roll, to see if their opponent's influence is removed (and possibly their own influence is added). Whenever a card is played for Ops, if an opponent's event is on the card, then that event will still occur. If you want to avoid this, you can play a card in Tiananmen Square (once per round), to try to get one of a variety of bonuses - and to prevent your opponent's event from occurring. One special type of event card is a scoring event. 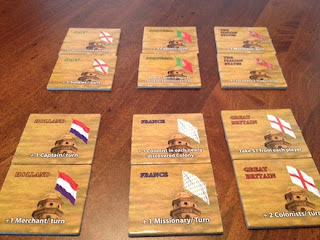 When a scoring event is played, a Power Struggle immediately ensues, where both players get cards based on their position in the scoring country, and they play a small mini-game with them. Whoever wins gets bonuses, which can include taking or keeping power in the country. Finally, the players score points based on each player's position in the country; and if the Communist player still has power, then they get a bonus based on the number of times the country has scored. Play continues like this until one player has 20 points (in a tug-of-war scoring, where only one player can have points at a time), or until 10 rounds have been played - signifying the end of the year. If all of the rounds have been played, one final scoring takes place, and the highest score wins. Realignment rolls and coups have been combined into "support checks"
Now, let's start digging into the pros and cons. The first major pro was that I found 1989 to be incredibly engaging. I enjoyed each of my games from start to finish, and I was even thinking about the games I played afterwards - and found myself really looking forward to the next time that I would be able to try it out. Now, I play games a lot (though I'd like to play even more), and I often find myself looking forward to game night - but normally I am thinking to myself "ok, what game do I need to play so that I can review it." With this one, I was thinking specifically about wanting to get together with someone to play 1989 - forget all of that "what should I play" nonsense, I wanted to play this. The next pro is fairly standard with all of the games that these designers make - I really appreciate the historical richness of the game. I like that each of the events are based on things that actually happened, and that, if I was willing to learn it, I could easily learn some history simply by playing a game that I enjoy! Another couple of pros that I will mention briefly are that I love the tug of war nature of the game, and I like that you have to make hard decisions (and sacrifices) during the game. Each game will be different based on who you play with, and what you draw. If I play with someone that is very interested in taking over Hungary, the entire first half of our game might be focusing on Hungary - because it's important to counter what your opponent is doing. 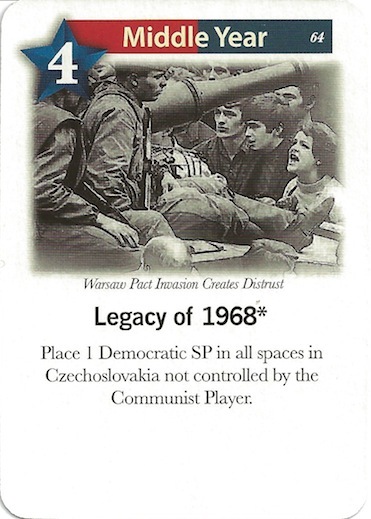 One example of this is that I drew an event (as the Communist player) that gave the Democratic player an influence in every city in Czechoslovakia where I did not have control. I spent the entire round building control in Czechoslovakia to mitigate this effect. My opponent naturally thought that I had a Czechoslovakia scoring card, and so he was countering my moves there. That's the great tug of war. Then, at some point, I knew that I had to give up and play the card - or throw it in Tiananmen Square. I chose to play this one and throw a different card away, so that I would get the 4 Ops points, even though it made me sacrifice a bit by giving my opponent some influence in Czechoslovakia. Now to talk about Power Struggles. If you like Twilight Struggle, then you will basically like or hate 1989 depending on your feelings about Power Struggles. When a Power Struggle ensues, each player gets 6 cards if they have at least one city in the scoring country. Then, for each additional city, they will get 2 more cards. 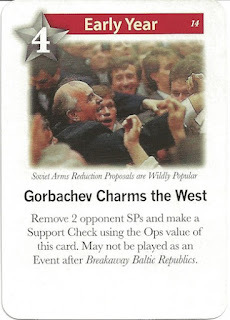 The cards come in 6 types - Petition, Strike, Rally, March, Leader, and Wild. (Though the Leaders really act as Wilds, and the "Wild" are more like events.) If you have a Leader, and you have the corresponding type in the scoring country (ie, you have an Elite Leader, and you control an Elite space in the country), then they can be used as any of the first four types. Whoever played the scoring card starts with initiative and plays a card. Their opponent then must play a card of the same type. If they are able to do this, then they roll a die, and if they roll at least the number in the corner of the player with initiative's card, then they get to take initiative. Otherwise, initiative stays the same. Cards are played back and forth like this until one player cannot play a card. That player loses the Power Struggle. Finally, both the winner and loser roll a die. The loser is rolling to see how much influence they have to remove from the scoring country. The winner is rolling to see how many victory points they earn (and if they are the Democratic player, to see if they take power in the country). I haven't decided my feelings about Power Struggles. Conceptually, I really like them. I think that they are a neat additional element of the game. I don't think that they are especially strategic - or, more specifically, I think that the strategy is fairly basic in them. But I enjoy them. Theoretically. However, when you draw 10 cards, and 5 of them are leaders that you can't play, you really feel like the game just punched you in the face. Or, if you draw 12 cards and don't have any of a certain suit - and then your opponent leads with that suit - you become disenfranchised with this mechanic. So, as I said, I still haven't really decided my feelings on this element of the game - but it is the single biggest change from Twilight Struggle. Now to get to the cons. I'll start off with a very minor con. As it turns out, I don't know my Eastern European geography especially well. So, when a card tells me that something happens in "Ruse," it will take me a while to figure out where that is (the first time - I do learn where it is on the gameboard eventually... though I still can't find it on a normal map). 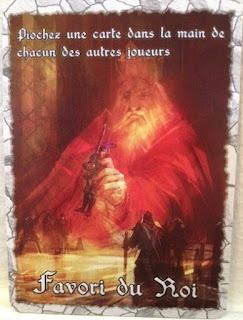 This con goes away as you keep playing the game, but it will probably be something that you will encounter in your first game or two. My bigger con is that the game seems to be a bit more luck influenced than it initially seems. More specifically, bad luck can be more detrimental than I would like. One example of this is in the Power Struggles that I mentioned earlier. Bad luck in a Power Struggle can be a major swing in points. For example, let's assume that I am the Democrat player and we are having a Power Struggle in Poland. It's the second time that Poland is scoring, I didn't do well the first time, but I have since gained a small advantage (2 more countries than my opponent). I have the advantage, so I "should" win the Power Struggle. 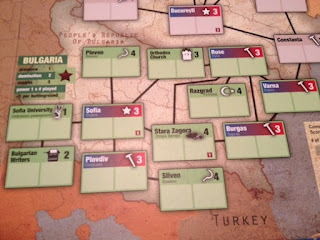 We score Poland, and I get a horrible draw in the Power Struggle and lose. I will possibly lose influence (making it harder to win the next struggle), my opponent may get some victory points (if he rolls well), but then I will also lose 6 points for letting the Communist player have power in Poland after it has scored a second time. Six points is a huge point swing based on bad luck. And, that's just one example - there is also a decent amount of luck about when the scoring cards are drawn, as well as who draws them. There is also luck in die rolling for Power Struggle results, support checks, and Tiananmen Square results. I'm not suggesting that the game is luck based, but what I am saying is that when you have bad luck at a critical juncture of the game, it will be incredibly frustrating. Overall, I give 1989 an 8.5/10. I really, really enjoy this game, but I have also been so frustrated by bad luck (I didn't win a single Power Struggle in my first two games, regardless of how many cards I or my opponent received, and often rolled a 6 afterwards, forcing me to remove quite a bit of influence) that I just can't give it a 9.0 or higher. With that said, it is one of the only games in recent memory that I think about between gaming sessions, and that I really have the urge to want to play (instead of wanting to play games in general). If 1989: Dawn of Freedom intrigues you, you should also check out (of course) 1960: The Making of the President, and Test of Fire: Bull Run 1861. 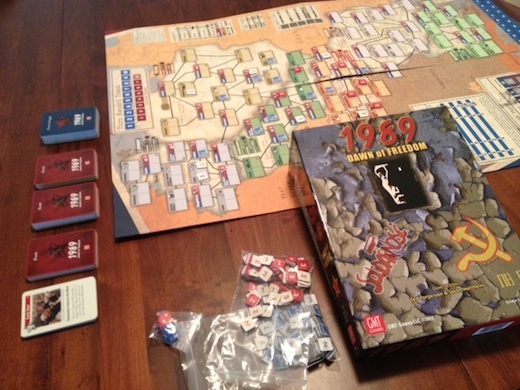 I would like to thank GMT Games for providing me with a review copy of 1989: Dawn of Freedom. So.... you know how sometimes you just feel like you're going to hate a game, before you even try it? Zendo was like that for me. It was explained as a game "of figuring out the rules", and so I immediately thought of the atrocious card game "Mau." (I absolutely hate Mau. If you don't know what it is then: 1) consider yourself lucky, and 2) you can find more information about it on Wikipedia.) However, since I claim I'm willing to try any game (and to be a good sport since I had just met these people), I tried it. 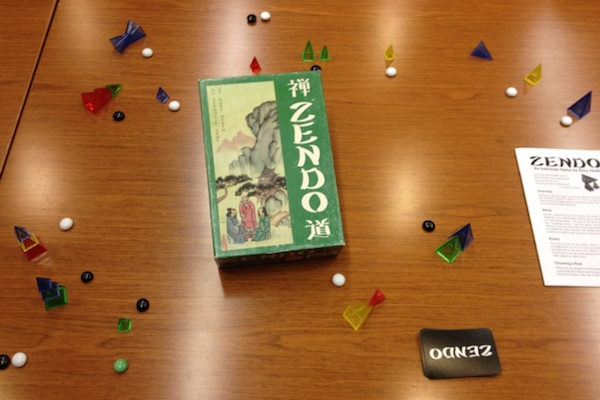 I was wrong - Zendo actually wound up being a very fun, laid back game. Therefore, my first pro is this: Zendo is a relaxing game. Most games that I play are fairly intense. This is because I'm (hyper-)competitive. I like to win. I'm willing to lose, but while I'm playing a game I'm doing everything I can to win. Zendo for whatever reason doesn't matter as much. Sure, I'd like to win, but it's also just fun to try to figure out the pattern. 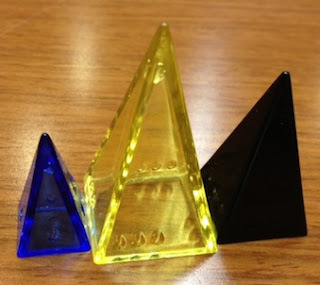 Secondly, I like that the difficulty of Zendo is scalable based on the group. I'm not incredibly dedicated to the game, so I probably won't ever play where there are complex rules (such as there has to be a red pyramid and there must be a small pyramid). However, for those people that do enjoy more complicated patterns, this is perfectly legal. You can make the pattern as complicated as the other players are willing to accept. My third pro is that the game is very inviting. It's something that could be played by most anybody (it might be problematic if you're color-blind). It can be enjoyed by both gamers and non-gamers alike, and it could even be a decent ice-breaking game. You could start playing it with 3-4 people, and before you know it there would be people around watching it that you could include in the next round (or if you're willing, you could even let them jump into that round). It's a very fluid and inviting game and is great for playing just to enjoy the experience. 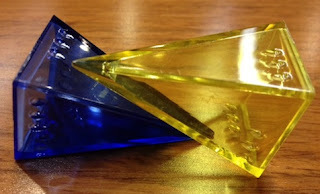 I don't really have any direct cons for Zendo, but at the same time I realize that this isn't a game that I'm going to get together specifically to play. This keeps it out of my upper echelon of games. However, this doesn't mean that Zendo isn't something that everyone can enjoy. I could easily see this being played at coffee shops, or any other gathering of friends. Overall, I give Zendo an 8.5/10. I try to reserve 9+ for games that I would get together specifically to play, and that's really the only thing that keeps Zendo from scoring quite a bit higher! If you somehow find a copy, or if you happen to have Icehouse Pieces (or were thinking about buying them for a different reason), I would definitely recommend that you try it out. It's hard to recommend games "like" Zendo. 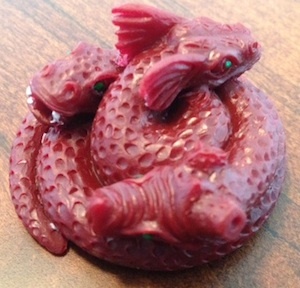 But, you might check out Tsuro, Jin Li, and Blue Moon City. 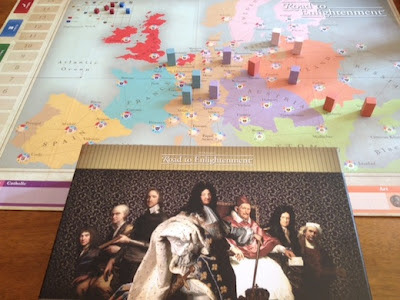 One of the latest games that my gaming group has received from Kickstarter is Road to Enlightenment (BoardGameGeek link, not Amazon). Just as a forewarning, I am writing this review after not completing a full game. There are a few reasons for this: first, I do not intend to ever go back and play a full game (and, I feel like this game warrants a review). Second, my "Reviews Alphabetically" page is keyed off of the word "Review" being in the title. If you prefer to think of it as a "First Impression" (that won't get a second impression), that's fine with me. If you feel that I need to play a game more than part of one time before my thoughts on it are valid, that's fine - I understand your position. This is why I'm warning you up front - so you can skip the rest of this post. In Road to Enlightenment, each player takes on the role of a monarch during the Age of Enlightenment. Each monarch has a different army strength, navy strength, monarch strength, weakness, and once per game effect. To start the game, you will also have 3 "favorite" luminaries and 10 luminaries that are selected blindly from the different luminary piles. Once all this is done, the game begins. Each round, every player will use the cards in their hand (generally 7 luminaries and your 3 "favorites") and set them up to perform 2 actions and collect taxes. When playing them as actions, you can play another card that allows you to "enhance" that action (and there are also luminaries that allow you to "respond" to an action). Once all of the actions are set, starting with the first player, each player will reveal their action and execute it. After both actions, players will do "Taxes and Trade". To do this, you reveal all of the cards that you have placed in the third pile and match up income and politics icons - then, take this total in coins and pay your upkeep cost. Play continues until the "Final Round" marker is encountered - allowing the game to be anywhere from 10-15 rounds long. The one other thing to mention is that there are "Cultural Census" rounds occasionally (set up randomly like the "Final Round" marker). During these rounds, players have the opportunity to participate in a "Cultural Census" instead of their second action. This census works similarly to the "Taxes and Trade" section, except that different icons are used. Whoever has the most icons gains 4 points on the corresponding track, and second place gains 2. Whoever has the most victory points from science, art, religious dogma, and taking over territories at the end of the game wins! Yes, I did say from the outset that I didn't finish my only game of Road to Enlightenment. And, so, you're probably expecting that this will be a glaringly negative review. However, Road to Enlightenment really has some cool aspects to it. First off, I really liked the historical setting of the game. Not being much of a history scholar, I really wasn't expecting to recognize many of the people in the game. Yet, even with my one college class in Western Civilization, I was able to recognize many names like Pascal, Rembrandt, and Blackbeard. Plus, it really made sense that I was trying to gain more science and art, since those truly were some focuses of the time period. The next thing that I found very interesting about Road to Enlightenment was how scoring worked on the science and art tracks. They had a "king of the hill" mechanic. So, if I gained science, and thus had as many points in science as someone else had previously, they would shift down one spot (and shift the next person down and so on until there is an empty scoring square). This mechanic was really neat. I still don't know if I "like" it, so much as thinking that it was innovative, but either way, I like that this gain Road to Enlightenment a unique twist. My third pro is that I really liked some of the concepts of Road to Enlightenment. For example, this was a time of religious turmoil in Europe, and this is represented by some monarchs being Catholic and some being "Anti-Catholic". This grouped players into teams that scored points together if the religious track was in alignment with their dogma. The uneven starting positions were also nice, and I also liked how the "favorite" luminaries worked (three cards not discarded and available to you each turn). Many of the other aspects of the game like stacking actions with enhancements, and how attacks are resolved (and how your allies can help) were also interesting. However, there were also some things that I disliked about Road to Enlightenment. First off, I cannot get over the fact that you get punished for taking over other players' territories. If you successfully take over an opponent's territory, you gain one victory point, and they lose two (at the end of the game). However, you also have to pay an extra coin of upkeep every round that you own the territory. Plus, if you take over a heavily fortified city (like Paris), then they have the advantage when trying to take it back! The harder a territory was for you to take, the easier it is for you to lose it. Because of all of these factors, there is absolutely no strategic reason (that I see) for attacking early in the game. This really limits your strategic options, and it also encourages all of the players to do the same actions, which will cause more chaos on the "King of the Hill" tracks - potentially even causing you to lose points during rounds in which you actually perform those actions (by having players go after you and knock you down the track)! Really, the ultimate reason that I will not go back to Road to Enlightenment is the time. One of the people playing the game had previously played, but had a few rules wrong the previous time. Because of this, he re-read through the rules and looked up some unclear situations on BoardGameGeek, and was teaching us how to play. With him teaching us, we got through the first 6 turns (of 15 - we looked and our "Final Round" was on the last possible space) in over 3.5 hours. Maybe that didn't quite sink in - after 3.5 hours, we weren't halfway through the game. The game has some really neat aspects to it, but it felt like it needed to get distilled more to it's essence so that it was playable in a reasonable amount of time. Now, yes, I know that wargamers are accustomed to games that take much longer than this, but I generally do not like to play games that take this long. And, in this case, I really didn't feel like there was enough going on in Road to Enlightenment to warrant this time. After all, essentially, you are taking 30 total actions in the game - two per round for 15 rounds. This has no business taking this long. So, what made it take so long? I've been kicking this around in my head. First, I think that the rules are very confusing, causing it to take quite a while to learn. Again, I believe that we were playing this correctly, as the person that was teaching us had done his due diligence to look up all of the rule ambiguities prior to the game. Next, I think that the game suffers horribly from poor graphic design, and players have to regularly compensate for this (which takes time). One example of this is that every luminary has text explaining what they can do instead of using iconography. Yes, I realize that heavy iconography (like in Race for the Galaxy) can make the learning curve a bit steeper on games. Yet, having things like "advance 1 on the culture (symbol) track" simplified by +1 (symbol) would greatly simplify things when looking to see what your options are. Here's the worst part of the graphic design that I noticed - there are (I think) 6 symbols that can appear in the top left corner of your luminary cards. But, they aren't always in the same order or location on the card! So, if I'm looking to see how much money I can make for taxes, I have to look for the income icon and the politics icon. But, I can't just line up my cards and see which have each icon, because I have to look at all of the icons on each card to see if one of them might be in a different location! 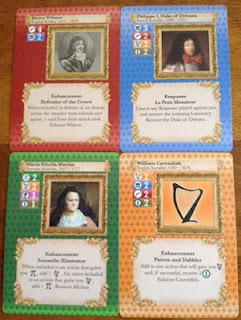 And then, add to this the (very thematic but) fiddly rule that if your monarch is Catholic, he cannot use politics from a luminary with Anti-Catholicism (and vice versa) and suddenly I have to look for a third icon on all of my cards. Again, without it being in the same spot on the card each time! The last con that I will list is that the game has "deck building" concepts in it - you will be gaining and losing luminaries. But this aspect didn't seem to work well. First, there is no way of getting rid of bad luminaries - you always have to replace them. And, so, you are constantly watering down your deck. Plus, there are some luminaries that are just better than others (an action that gains two science is better than one that gains one). But, since the draw is blind, you have to get lucky to draw these, and they are generally removed from your deck as soon as they're played. Which then means that your deck is constantly getting worse. Add to all of this that we had one pile completely empty for most of our four player game. And the game goes up to seven players - with this many players, you will really be forced to take what is available instead of what you actually want. Furthermore, the cards you gain are put in your discard ("exhausted") pile and reshuffled every turn before drawing - so there is no guarantee that you will ever see any given card that you gain. Overall, I give Road to Enlightenment a 4.0/10. I think that there are some neat concepts in this game, and that is really why it was disappointing. Ultimately, though, the cons outweigh the pros heavily enough that I won't want to play it again, and the longevity of the game makes it fall into my "broken" category (but just barely). 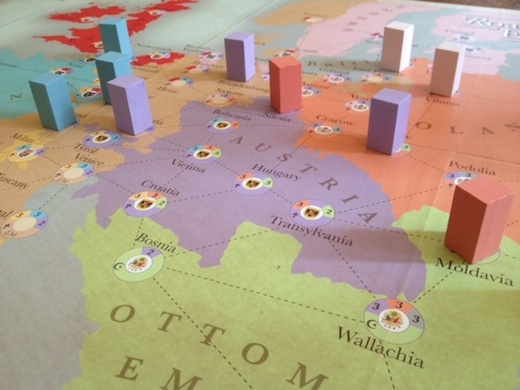 If you like historically based games, you might also want to check out Twilight Struggle, 1960: The Making of the President, and Axis and Allies: Pacific. Due to my interest in playing Biblios, I also wound up with an opportunity to play Scripts and Scribes: The Dice Game. 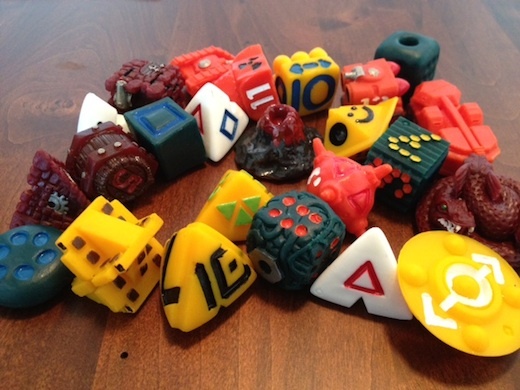 In Scripts and Scribes: The Dice Game, the goal is to get the most gold. 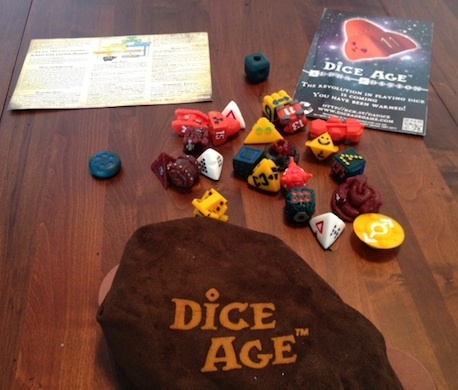 Every turn, the active player will roll all of the dice (1 gold die, 5 resource dice, and 1 adjustment die). Then, depending on what is rolled on the gold die, various things might happen. In a "standard" turn (when a coin is rolled), players take turns selecting groups of matching dice and moving their token up on the corresponding resource track, gaining gold, or adjusting the end of game value of one of the resource tracks. If the gold die rolls an "auction for resources" then an auction begins, with the winner getting to use all of the dice - and then the active player rolls the dice again. The gold die can also roll an "auction for gold" in which the players bid how few gold coins that they are willing to accept to permanently remove a token from the game - then the active player re-rolls all the dice. Finally, the gold die might show a re-roll icon, which allows the active player to re-roll any or all of the resource dice, but must pay one more gold each time that he re-rolls a group of dice. Play continues until three scoring markers are at the top of resource groups, someone reaches the top of the abbot track (a resource track that's not worth points at the end of the game), or one player has removed four tokens. Then, whoever is winning each resource track gains gold equal to the value of that track (indicated by a die) times three, and second place gains the value of the track. Whoever has the most gold wins! The first pro that I have for the Scripts & Scribes Dice Game is how the "auction for gold" works. Inevitably, you will have certain resources in which you are not going to be first or second place. So, why bother even keeping the token for this resource? The auction for gold lets you trade it in to at least make a few coins, since you knew you weren't going to make any otherwise. Of course, if the auction for gold is rolled early in the game, then you have to decide if you're willing to sacrifice a resource that you have a good chance to win in order to get extra gold. And, based on if this auction is rolled early or late in the game will adjust the value of your token - if you sacrifice it early in the game when you still have an opportunity to win any given resource, it might be worth 6 or more gold. Whereas, at the end of the game, when everyone has a token that they can sacrifice, it might only be worth 1-3 gold. The next pro that I have is how the auction for resources work. Instead of knowing exactly how much each player has bid, the auction is a combination of a silent auction and an open auction. It is fair knowledge to know how many cards each player has bid, but not how much gold. However, if you bid with a card, you cannot pick it back up later - so, if you only have cards worth 1, 2, 3, and 5 in your hand to start, you might have to consider which of these you're going to bid with to start the auction. After all, starting with the 1 is "safe", but if you bid them in order, you are progressively bidding higher, whereas your opponents might be only bidding 1's - and since only the number of cards is open knowledge, you have no idea if you're horribly overbidding. It allows your opponents to try to bluff you into bidding higher - or lower, if they throw less cards. The next thing that you need to be aware of is that this is a dice game. This means that weird things will happen that slaughter all probabilities. I've played in one game where the "auction for gold" was rolled three times in a row to start the game (and the "auction for resources" was never rolled in that game). I've also played where the opposite was true - "auction for resources" was rolled repeatedly, and "auction for gold" was never rolled. You also might have all of the dice roll the same resource. Conversely, you might have the opportunity to re-roll and spend gold trying to make all of the dice show the same resource, only to spend all of your money and never have it happen. Dice games are very, very random - so be aware of that, and if that's not something you would enjoy, then you should probably avoid them. So, Scripts and Scribes the Dice Game is the Dice Game for Biblios (also known as Scripts and Scribes, if you were wondering about how they are connected). Biblios is a much "tighter" game than it's Dice Game equivalent. Since that term really doesn't mean much, let me describe what I mean by it. In Biblios, things are carefully balanced out, and as a player, you have several opportunities to plan ahead. You won't know everything that will be available to you later in the game (there is a random element in the setup, and the other players also affect this), but you still know generally what will happen and can plan accordingly. The Dice Game has strategy involved, but planning might be completely thwarted. Whatever you plan for may never even be possible due to the roll. So... now that I'm thinking through this con, I'm realizing that I may lean towards the disliking how random dice games are side of my "neutral" point in the previous paragraph! Overall, I give Scripts & Scribes: The Dice Game a 7.5/10. It had some really fun elements, but I think that I would overall rather play Biblios, and have a random element that isn't quite as drastic. Yet, I think that Scripts & Scribes: The Dice Game makes for a good strategic choice that is easy to teach to new people, and the randomness helps them have a better chance to win. 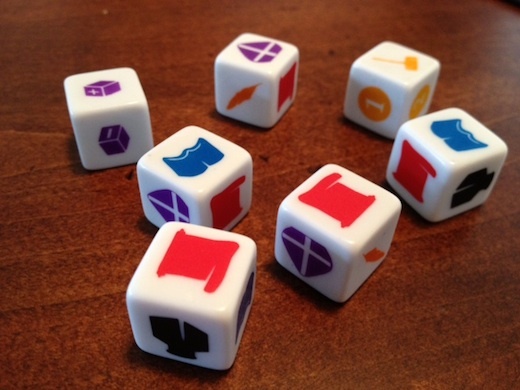 If you like die games, you might also check out Take It or Leave It, Cookie Fu, Martian Dice, and Catan - the Dice Game. 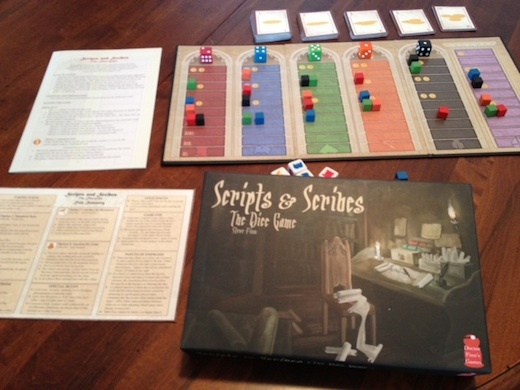 I would like to thank Dr. Finn's Games for providing me with a review copy of Scripts and Scribes: The Dice Game. 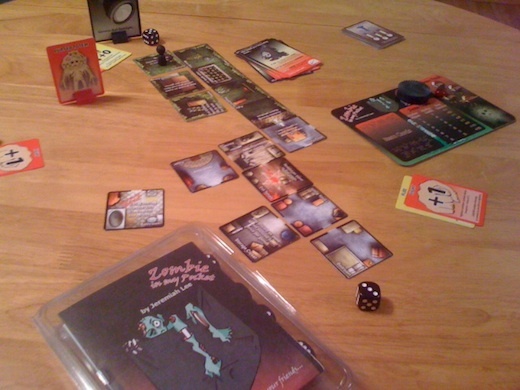 A quick game where you can get your zombie-fix is Zombie in my Pocket. 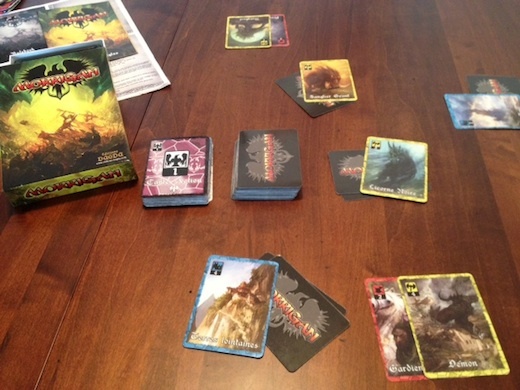 In Zombie in my Pocket, the object of the game is to find the Cursed Totem (and let your buddy carry it - after all, it is cursed), find the Sacred Etchings, and then bury the Cursed Totem to stop the Zombie Apocalypse that is infesting your backyard. To do this, each turn one of the players gets to serve as leader. He then decides on one of three courses of action for the "team": explore, perform an event in the current location (if available), or cower (to regain one health for each player still in the game). If you explore or attempt an event, then you must resolve the top card from the Event Deck (normally get jumped by large numbers of Zombies). If you choose to cower, then you simply discard the top card from the Event Deck. If you are able to successfully bury the Totem before going through the Event Deck three times, then whoever is still alive wins; if not, then you all lose. Oh, and if you all die you all lose. The first thing that I like about Zombie in my Pocket is the Event Deck serving as a timer. This forces the players to continue exploring instead of constantly cowering. Another neat aspect of this is that whenever an Item card would be found, an Event card is flipped to determine which Item is received - which means that you have to waste time in order to find the Item. This is often worth the time lost, but sometimes a greedy leader can cost the entire group the game! Another aspect of the Event Cards is that they get progressively more difficult as the game continues. This means, if you are able to explore everything incredibly quickly and find and bury the Totem, then you can win with minimal cowering. However, if things start going wrong and you start cowering and wasting cards in the deck, well, you should hope you gained items at some point. Otherwise, the Zombie Horde will probably cause problems for you. The last thing pro that I will mention about Zombie in my Pocket is the Fight or Flee mechanic. Whenever your group encounters a group of Zombies, each player must independently determine if it is in his best interests to fight or to flee. Then, everyone reveals their decision at the same time. If everyone flees, everyone loses a life and you return to the previous room. If everyone fights, then you compare your total strength (one per player plus any weapons) to the total strength of the Zombies (normally more than what you have) and damage is dealt out as evenly as possible. However, if some people decide to fight while other players decide to abandon their "teammates", then the ones who fled get to gain health by abandoning their friends. Yeah, that's fairly awesome. I enjoyed constantly pondering whether I should abandon my friends or not (and acting like I was going to abandon them each time). Of course, in the end, I was left to hold off an entire Zombie Army with only my wits, my looks, and my Chainsaw... needless to say, I was not a winner in that game. A neutral point of note about Zombie in my Pocket is that there is not a large amount of replayability in the game. Whereas this is almost always a con in my reviews, I do not see it as a con here. Zombie in my Pocket, I believe, was designed as a light game in which you could play a quick scenario and enjoy running away from Zombies. It is priced accordingly. It isn't Betrayal At House On The Hill or Arkham Horror - don't expect it to be. I don't think that you should go buy this game thinking that it will provide you unending hours of entertainment. Go into it expecting that you should be able to get what you pay for - that it should be able to entertain you to play through it several times, and then you can move on from the game. The first (and biggest) con that I have to Zombie in my Pocket is that the board is designed in a way that it is possible to run into a deadend in every direction. In one of our games, I noticed that we only had one valid open door left, and so I cheated to see if we had any deadend rooms left. Sure enough, we had one. I shuffled all of the remaining tiles and pulled a random one - it was the deadend! At this point, there was no way to win the game because the architect of the mansion did not see fit to include hallways to each of the inner rooms (so where these Zombies were coming from was beyond me). We re-shuffled the draw pile and took a different room instead, thus continuing our game, but it seems to be a flaw in the game if you can run into this kind of situation. Overall, I give Zombie in my Pocket a 7.5/10. It is what it is - a simple, single scenario, Zombie game. It is fun, I in no way am disappointed in it, but I will probably move on and play other games now. If you like Zombie or Horror-themed games, you might also check out Nightfall, Zombie Dice, and (of course) Betrayal at House on the Hill.